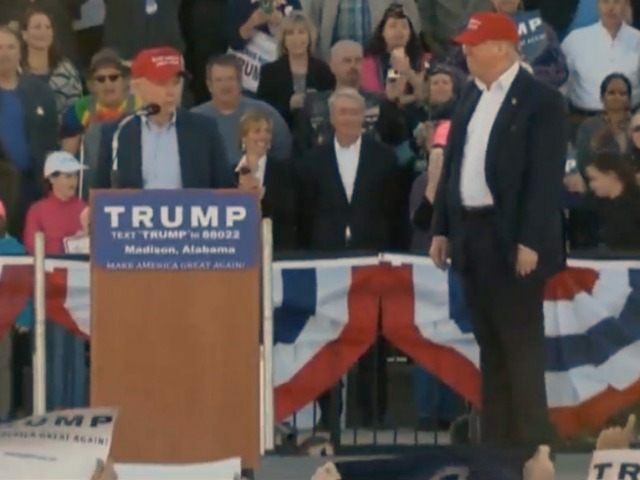 MADISON, Alabama — 2016 GOP presidential frontrunner billionaire Donald Trump picked up the most significant endorsement any presidential candidate in the GOP can get here on Sunday: Sen. Jeff Sessions (R-AL). Sessions, the intellectual leader of the future of the conservative movement, has provided the brainpower behind the populist nationalist revolt against political elites that’s been emerging since at least 2013. At a warm and windy rally here with thousands present in a packed football stadium just outside Huntsville, Sessions appeared on stage with Trump to back him for president. Sessions’ endorsement provides Trump with even more legitimacy as Trump’s two remaining serious opponents—Sens. Marco Rubio (R-FL) and Ted Cruz (R-TX)—attempt to undermine him in a desperate bid by the donor class to regain control of the party from populists revolting in elections around the country. Sessions backing Trump is a significant blow to both Rubio and Cruz, as now the powerful Alabamian will be putting his entire operation all in behind Trump. Sessions’ backing is the latest and highest-profile in a string of significant endorsements for Trump’s rebel campaign. New Jersey Gov. Chris Christie, after dropping out of the race himself despite landing significant blows on Rubio in the final debate before New Hampshire’s primaries, backed Trump this week, as did Maine Gov. Paul LePage and former Arizona Gov. Jan Brewer, as well as Reps. Duncan Hunter (R-CA) and Chris Collins (R-NY). Sessions’ old communications director Stephen Miller joined Trump’s campaign earlier in the cycle as a senior policy adviser, and the two populists have been close before. But now it’s official with Sessions’ public endorsement of Trump. Now that Sessions has officially backed Trump for president, his enormous respect among Republican voters nationwide—and especially in Super Tuesday states like here in Alabama—and among Republicans party-wide in Washington is sure to give Trump a game-change-level boost heading into Super Tuesday and future states. If Trump wins big on Super Tuesday—he’s polling ahead of his rivals in almost every Super Tuesday state, except Cruz’s Texas—it sets him up for a significant battle to take down Rubio in Florida. Currently, Trump is polling well ahead of Rubio in the Florida senator’s home state—an embarrassment for the young first-term senator. A win by Trump over Rubio in Florida would almost certainly end the Rubio presidential campaign, as the young senator and his campaign have promised publicly they will win Florida.